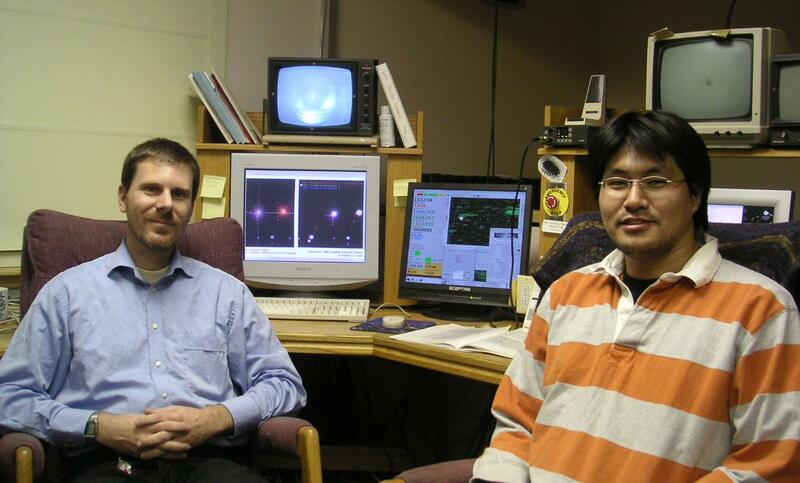 On April 2, Arizona State University researcher Rolf Jansen and graduate student Kazuyuki Tamura were operating the 1.8m (5.9 foot) Vatican Advanced Technology Telescope (VATT) atop Mt.Graham, Arizona. They turned the scope to CGCG 223-029, an early-type spiral galaxy undergoing a burst of star formation, as part of a study with collaborator Norman Grogin of Johns Hopkins University. They then captured two 5-minute exposures with the telescope's CCD camera. Jansen noticed a conspicuous point-like object appeared a few arcseconds southeast of the galaxy's nucleus. "It was a typical 'Hmm, that's odd' experience," he told Astronomy. The 18th-magnitude object was stationary on images acquired on subsequent nights. It didn't appear in Sloan Digital Sky Survey images or in an image Grogin took of the galaxy a decade earlier. Jansen and Tamura think they've found a supernova and encourage spectroscopic and photometric follow-up (a PDF finder chart is here).